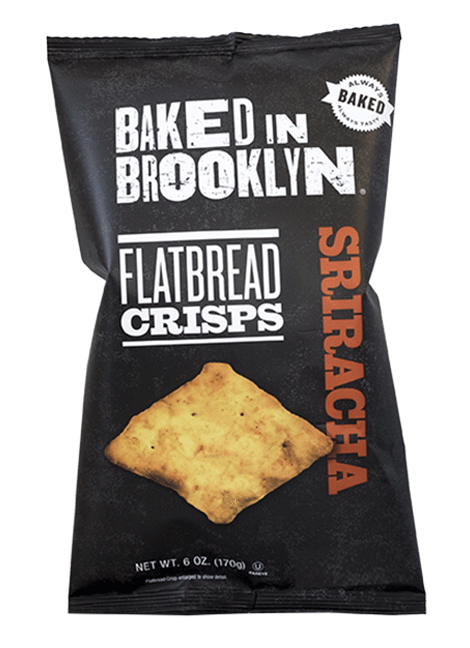 Our Sriracha Flatbread Crisps are always baked—never fried—and are seasoned with Sriracha, which gives these crisps a kick! Try them on their own or with your favorite dips, spreads and toppings. Enriched wheat flour (wheat flour, malted barley flour, niacin, iron, thiamine mononitrate, riboflavin, folic acid), water, high oleic sunflower oil with rosemary extract, sriracha seasoning (vinegar powder, maltodextrin, sugar, salt, paprika, vegetable oil, silicon dioxide), dehydrated potatoes, contains 2% or less of the following: soy protein concentrate, sugar, wheat flour, lactic acid, enzymes, natural flavors, oat fiber, sea salt, yeast. Contains: wheat, soy.